Kai Kristiansen’s designs have become some of the most famous pieces to be created in the mid part of the 20th century. His name has become synonymous with Danish modern. He apprenticed as a cabinet maker, finishing in 1948 and then went on to train under Kaare Klint at the Danish Academy of Fine Arts. Subsequently he went on to open his own office and designed for many companies such as Schou Andersen Møbelfabrik, Feldballes, Magnus Olesen, Fritz Hansen, Axel Kjærsgaard and Heltborg. He designed many pieces of furniture such as sideboards, desks, chairs, tables, shelving units and cabinetry. His FM shelving system was widely popular not only Scandinavia but also throughout North America and the rest of Europe for its flexiblility and design. But surely his most beloved and popular design is the #42 chair for Schou Andersen. 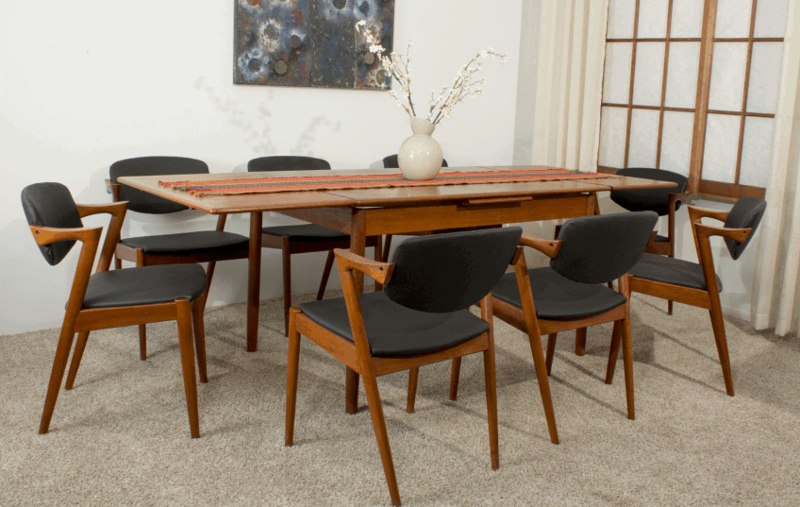 Sought after for not only it’s beautiful looks, but it’s comfort and elegance, it has become one of the most iconic Danish modern pieces of furniture. Kai Kristiansen Z dining chair (Model 42). He principally designed his furniture to be executed in teak or rosewood. The grain of these species of is particularly striking, especially the Brazilian rosewood. This marked quality in the grain of the wood adds a strong sculptural quality to the particular piece. Here at MidMod decor we have a number of examples of Kai Kristiansen’s design work. Currently in our inventory we have a set of eight of his #42 chair constructed in teak (click here). This set has just been reupholstered in black high quality faux. Six of Kristiansen’s round backed dining chairs. We also have a set six of Kristiansen’s round backed dining chairs in teak. Two of the set are designed for the end of the table and are upholstered in the original black faux leather. The other four chairs are designed as side chairs and their backs are in bent plywood veneer. These are currently being refurbished in our shop, if you are interested please inquire at info@midmod-decor.com. We have an example of one of Kristiansen’s lovely pieces of casework, an elegant bow-front tall boy dresser (click here). The teak veneer is beautifully matched and highly figured. This all original tallboy is truly beautiful. Kai K’s elegant base and masterful sense of detail on the edges sets this bureau apart from the crowd. The drawers are useful-sized, and because it is only 31½” wide, it will fit in places your usual 36” wide tallboy will not. Kai Kristiansen Bow Front Tallboy Dresser. Co-Owner of MidMod Decor, LLC and lover of all things mid-century modern.